By: Chad Bruce – President/Owner, GluDown, Inc. It is fair to say that the OSHA 1926.1153 ruling, effective since September 2017, has had a tremendous impact on the construction industry as a whole. 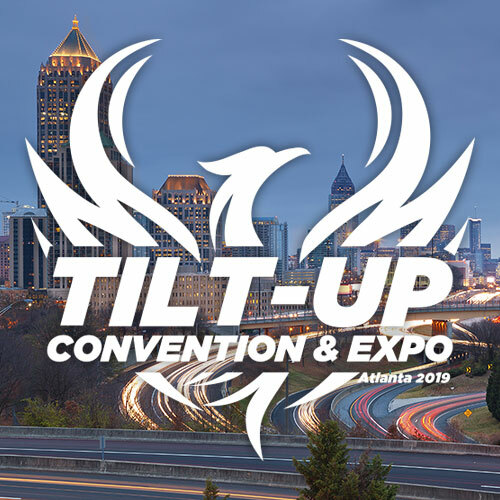 In tilt-up, we have seen how this regulation has influenced and changed several aspects of the tilt process, from saw cutting concrete to drilling and nailing forming materials. Although this regulation has helped create a safer work environment, it has also created challenges from productivity to learning new processes and techniques. During the annual TCA Convention in Miami, we spoke with several contractors who understood the impact this regulation would have on their current drilling and nailing process, and were unsure whether it would be better to make the costly adjustments required to adhere to the ruling or to find an alternative approach, like using adhesives. As part of these conversations, we recognized a need for a best practices guide related to how to use adhesives in the forming process. This guide would not be made because workers are unfamiliar with the use of adhesives – far from that. Instead, it is because most people have never been taught how to properly use adhesives, and, in some cases, they have developed some bad habits. 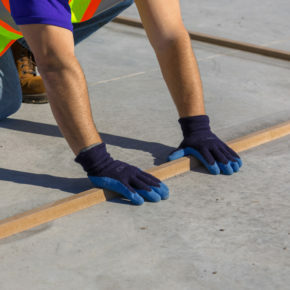 It is extremely important to keep in mind that these adhesive solutions are designed to be temporary; otherwise they would remove concrete when the materials are separated from the slab. Below are some best practices, tips and tricks to help you be successful on your next glue-down job. Nothing has more influence on bond strength than the materials you are bonding. Curved and warped materials have memory, which often negatively impacts the strength of a bond. Materials that are not moisture resistant can expand and contract from weather damaging the bond. Materials saturated in water or with beaded water on their surface must be dried before bonding. Some plastic materials, such as double chamfer and reveal, are designed with a curved bottom so that there is a gap between the material and the slab. If your material has this design, it is important to use adhesives with gap filling properties. Using high-quality materials that are designed for gluing down is essential for success. The moisture level in the slab can impact adhesive bond strength. A common best practice is to allow the slab to dry for at least three days before bonding material to it. This timeline can change based on the concrete mix and environmental factors. Perform ASTM D4263 to check concrete moisture. High levels of moisture can reduce adhesive performance. Densifier, seal coating and bond breaker chemicals are designed to prevent adhesives from bonding to them. 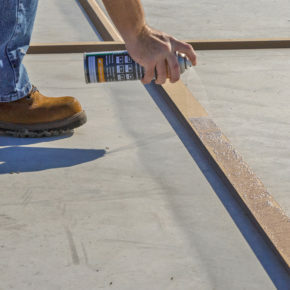 For maximum adhesive strength, apply bond breakers and densifiers after bonding materials to slab. Some adhesives can be successfully used on a single layer of seal coating, bond breaker, or densifier; however, the more layers applied, the more difficult it is to bond to them. If adhering materials to the slab after a densifier or bond breaker has been applied, use a fast-flashing solvent, such as Xylene, to remove these chemicals from the area to be bonded. Make sure the Xylene has fully evaporated prior to applying the adhesive. Never use mineral spirits or other oily cleaners, which do not naturally evaporate and leave residue on the slab, to prep the surface for bonding. Gluing is like painting. The same care used in prepping to apply paint should be used for gluing. If you wipe your finger on the slab and pull up dirt, oil, dust or any debris, the slab will not be clean enough to bond to. Flash/ready time is the amount of time before the adhesive is ready to be assembled. Open time is the amount of time you have before the materials must be assembled. Follow the adhesive’s manufacturer guidelines for best success. Most adhesives take 12 or more hours before reaching maximum strength. Working with bonded materials before the adhesive has fully cured can negatively impact the strength of the bond and, in some cases, break the bond. Use hands, not feet or heavy tools, to test initial adhesive strength. More is not better! Applying too much adhesive can decrease bond strength and increase flash/ready time. For heavy load materials, such as forming brackets, it is critical for the bonded surface area to be large enough to withstand the load. If the surface area is too small, the adhesive does not have enough strength to hold the materials in place under load. Over application of bond breakers to bonded materials can affect adhesive strength and cause bonded materials to let go. If there is an issue with bonded materials in one area and not another, then there is another factor at play. Look for differences in materials, prep work, or application of adhesive. Supervisors down to crewman need to be properly trained on gluing. In low temperatures (40 F and below) adhesives often become brittle and unable to bond, or the amount of ready time increases significantly. In high temperatures (120 F and above) adhesives can become soft and flexible, decreasing bond strength. Using adhesives in the morning during summer months and in the afternoon during winter months can improve performance in extreme conditions. Adhesives should be stored in controlled environments. 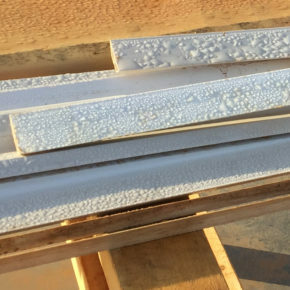 Extreme temperatures can negatively impact the adhesive and its shelf life. In high temperature months, leave small gaps between bonded materials to allow for expansion. Seal coating and bond breaker chemicals can react with water to create a “soapy” film on the slab. Properly cleaning a slab after rain is required for adhesive success. As mentioned in the ‘Materials’ section, slabs or materials that have water on them must be dried prior to bonding. If rain is forecasted, ensure that materials are bonded and the adhesive has enough time to reach maximum strength prior to water exposure. Cover materials to be bonded with plastic to prevent water absorption. Adhesives can soften in standing water. Allowing the adhesive to properly dry and regain its strength before working in panels can provide a more successful experience. Adhesives are regulated chemicals. Be aware of the VOC content and specific chemicals in adhesives used on your projects. Regulations vary from state to state, and fines can be heavy. Only use adhesives that are approved for use at the job site location. If you do not know whether or not a certain adhesive is approved, contact the manufacturer. Adhesives can be cleaned off the slab using a long-handled scraper and water or a chemical cleaning agent. 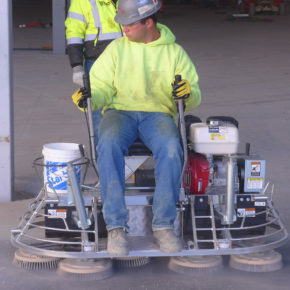 Riding trowels or walk behinds with brush attachments can also be used for cleanup. Apply water to the surface prior to using a brush system to increase cleaning speed. 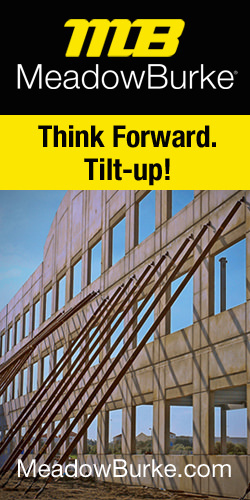 Tilt-up is an incredibly complex industry, and very rarely does one size fit all. These best practices are designed to act as a guide and to create a framework for success. This is by no means an exhaustive list. It is highly recommended that those who are considering transitioning from drilling and nailing to gluing down reach out to a TCA member who can provide insight into using adhesives as a solution.